Located in Stanley Park, an artwork called "Nobody Likes Me" has gained worldwide attention online, including from Banksy, one of the street art world's biggest names. However, that wasn't part of the plan for the artwork's Vancouver creator, iHeart. "I see people walking down streets barely glancing up from their devices. Digitally we're hyper-connected and yet so disconnected from each other," he told me. "There's almost too much irony that happened with this piece. Posting it on Instagram, Facebook, my website, and Twitter, then it going viral. Basically the idea behind the piece completely backfired." Asked why Vancouver is home to the piece, iHeart replies: "I feel like a guidance counsellor when I talk about Vancouver. It has so much potential but applies itself inappropriately. Vancouver is a young, dynamic and creative city, but is way too distracted." Much like disdain for distraction, the street artist of four years, isn't interested in fame either: "Anonymity is a must. I think a lot of people fantasize about the idea of celebrity, but the little taste I got was really overwhelming and awkward." 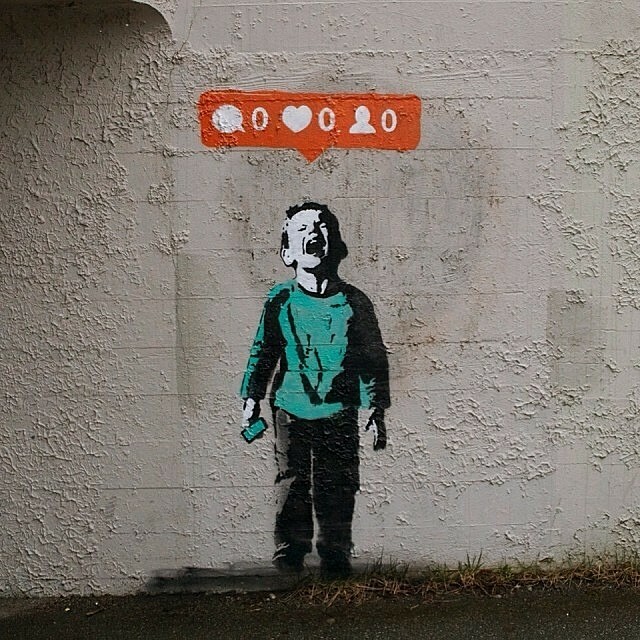 Like it or not, iHeart is receiving lots of attention after Banksy shared the image on Facebook. It immediately went viral and fans even started drawing comparisons between the two. "I think being compared to Banksy is cool just as much as its annoying. As far as stencils go, most people can probably only name one, maybe two street artists, let alone stencil artists. Banksy's career has been nothing shy of amazing. He's a heavy hitter and its nice to be put in the same league," said iHeart. As for more pieces gracing our city, iHeart's answer only enhances the mystery, simply stating, "Who knows?" In the meantime, if you want a piece of the puzzle that is iHeart, you're in luck. An original print will be placed in a mystery location today (Thursday, March 13) at 6 p.m. Check iHeart's Instagram, Facebook, Twitter and website for location details. Follow Sunny Lenarduzzi on Twitter and Instagram @SunnyLenarduzzi.